Best seasons: Mar, Apr, May, Sept, Oct, Nov. Situated at an average elevation of 8,500 feet high from sea level, home to many of Bhutan's oldest temples and monasteries. Paro valley has managed to keep its bucolic nature in spite of the Bhutan's only airport and many development activities. Depending on season the valley floor is covered with brown or green fields, while small villages and isolated farms dot the landscape. The valley is also known for the produce of Bhutan's famous red rice. It has always been one of country’s strongest and important fortresses and on several occasions it was used for defending the valley from the Tibetan incursions. Kyichu Lhakhang - 659 AD by King Songtsen Gampo of Tibet. 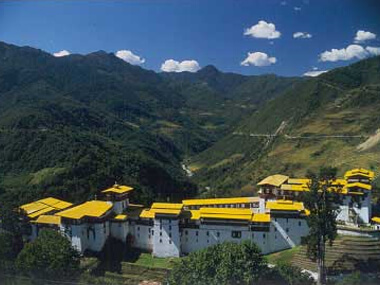 Drugyal Dzong - 1949, built by Zhabdrung Ngawang Namgyal to commemorate victory over Tibetan invaders. Nunnery - Consists of 200 Nuns and is about 2 hours' walk from Paro topwn. 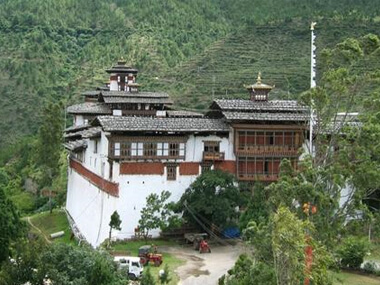 Located at same elevation as Punakha, it's about 30 minutes of drive from Punakha. 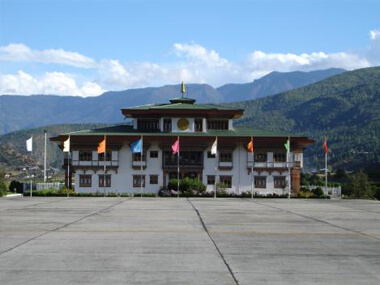 It is the last town of western Bhutan before you enter into the central part of Bhutan. Known for fine bamboo work and its slate carvings. Wangdue Dzong, Shabdrung Ngawang Namgyal in 1638 had built this massive fortress sitting on a hilltop at the confluence of Punakha Chu and Tang Chu Rivers. Wangdue Festival is celebrated here in the fall. Best season: Jan, Mar, Apr, Sept, Oct, Nov. It is the border town and the gateway to the south. It is the commercial centre and is situated at the base of the Himalayan foothills. 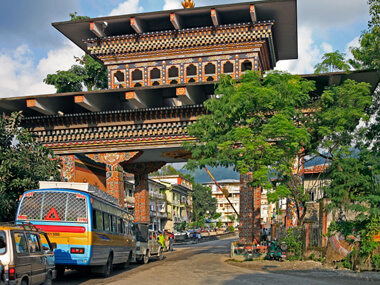 Phuntsholing serves as the convenient entry/exit point for the Bhutanese and also a link to visit Indian state of West Bengal, Sikkim and Assam. A few minutes ride and you could view the beautiful scenery, border of Jaigoan (West Bengal) and Phuntsholing. It takes about 4 hours from Phobjikha to reach Trongsa by car. Located at an altitude of 7600 feet above sea level, Trongsa forms the central hub of the nation and is historically the place from where the nation was unified. The landscape around Trongsa is spectacular and for miles on end, the Dzong seems to tease you, wondering if you will ever reach there.